This one was probably a little overambitious, but I surprisingly managed to go only five minutes over the time limit. I wanted to make a single-screen platformer, and figured that rather than adding enemies and having to worry about AI, I should just add some simple objects to be collected within a time limit. I’m not quite sure what the issue was, perhaps some limit within Haxe on multi-line strings? At any rate, this whole issue set me back and annoyingly I probably would have completed the remainder of the game in under fifteen minutes if I hadn’t have gotten stuck. Ah well, I still finished a game and it even contains procedurally generated content! 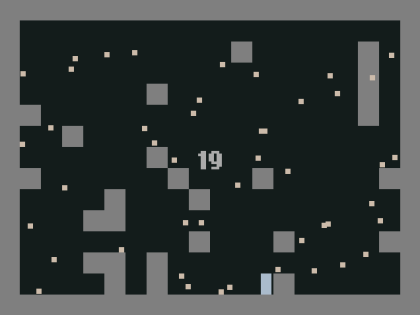 It may just be randomly setting tiles to create random platforms, but it still counts…I think.